Last week was not a week dedicated to cooking. Sebastian, my oldest was in the school play and Lewis was handling the lighting. Dinner was about the balancing act of late rehearsals and bedtime, not experimenting with new recipes and playing in the kitchen. However the first night of the play the boys got out of school at 11:30 am and I decided to bake cookies while they played outside. Who needs a balanced dinner when there are cookies? These cookies are actually low enough in sugar they could be served as a bread serving in the school lunch or CACFP (Child and Adult Care Food Program). so they could even be dinner! 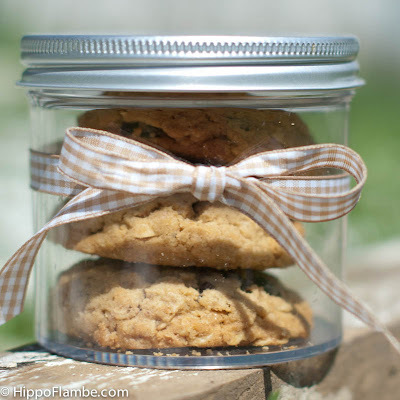 When I gave both boys a cookie to eat I told them I was finally done looking for new peanut butter cookie recipes because I had found my favorite. Sebastian, who apparently knows me well replied, "Unless you find one you want to test." So yes, unless I find a peanut butter cookie recipe I want to test these are my new favorite. 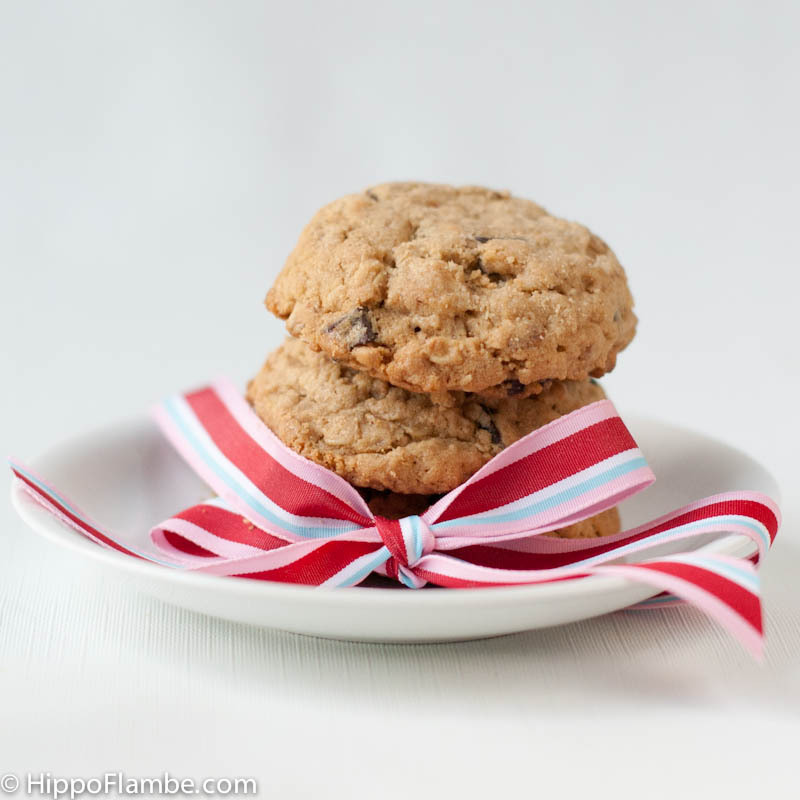 Chewy without being crumbly, full of peanut flavor and chunks of peanut for crunch, a depth of flavor that comes from the oats and wheat flour and then pools of dark chocolate to contrast with the peanuts. These cookies can also be made with other nut butters and matching chopped nuts (or use sunflower seeds and sunflower butter for a nut free version). Preheat your oven to 350° with the racks in the upper and lower thirds of the oven. Melt 1/2 stick (4 Tbsp) butter in a medium saucepan over medium heat. Add the oats to the melted butter and continue to cook over medium heat, while stirring, until the oats are toasted, about 5 to 7 minutes. Remove the pan from the heat and stir for a little longer until the pan cools down a little, just a minute or 2. Alternatively you can dump the toasted oats onto a parchment lined baking sheet to cool. Beat one stick of butter (8 Tbsp or 1/2 cup) in a mixer on medium high with the sugars until pale and fluffy. If you are not using a self scraping beater blade , stop the mixer occasionally to scrape the bowl. Add the egg and vanilla, beat until well incorporated before adding the nut butter. Beat on medium speed until the mixture is well combined. Add toasted oats chopped nuts and chocolate, beat on medium speed until combined. Add both flours and beat until just combined. Scoop out dough using a 1-1/2-Tablespoon scoop or roll dough into 1 1/2 inch balls. Place cookie dough 1 inch apart on parchment lined baking sheets. Bake for 12 to 15 minutes, until golden, switching the pans front to back and between racks after 6 minutes. Allow cookies to cool completely on the baking sheets. Be sure to eat several cookies while they are still warm.